Update: Congrats to Chaya #68! Email me & we'll get it out to you. My son just asked if this is Christmas fabric, no honey, I put the Santa hats on. and on a treasure hunt (my personal favorite). People, next week at this time, it will Christmas Eve! I'm so not ready, but trying. I'll get sewing any minute now. 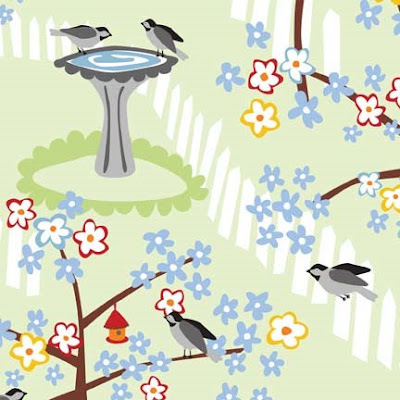 Leave a comment about what's in your backyard. rain! my backyard is filled with rain now, so wonderful! great favbric, I love the treasure hunt one! I was just admiring that fabric line a day ago. Really cute! In my back yard?? A mother hen who is ill, I took her to the vet today. Here's hoping she is better tomorrow. Her chicks are 3 weeks old. Another hen, whose chicks are hatching as I write :-) 2 pigs, 2 cattle, 8 laying hens and a cat. Lots of waist high grass. I love your fabric!So cute! Squeeeeeee!!! I heart this fabric! We have deer, racoons, and squirrels in our back yard. Okay, and a swing set, childs ride on John Deere tractor thing, my worm bin, a campfire area with chairs around it...yes an eclectic gathering of items, but it's home! 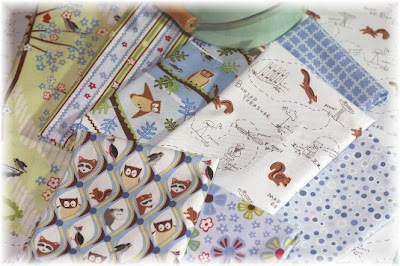 That is such a sweet fabric line. So adorable! In my backyard we have our veggie garden growing us summer crops like strawberries and tomatoes and in the last week our grape vine has just grown like crazy all over to our neighbors side and all over our orange tree. Then right down the bottom is our new hot tub. We have a bayou in our backyard (that getting pretty high 'cause of the record rains we've been getting) with tons of trees - it looks very tropical. We also have a tire swing and a baby swing hanging from a great big ol' tree, a huge wooden climbey/slide thing, and tons of other toys for my Darling Stinker, Serenity! AND I have a really strong suspicion that a gator dug a hole in our levee to hibernate! My backyard is home to my 15 hens & the "Evil One", a name that my lone rooster fully deserves! LOL! I nicknamed him that after he attacked me for the umpteenth time! My husband & son would love to make chicken soup out of him, but he is too handsome to end up in some pot! So for now, he can go ahead & rule my backyard & I will just keep running & dodging his wrath! LOL! I would be surprised to have anything, since I don't have one!! ^^. But if I did, I would have a wooden table & bench to have lunch in summer, and a gorgeous swing with an even "gorgeouser" summer quilt (because naps after having lunch in the summer are the best thing). In my backyard everything is covered in snow quietly waiting for Christmas. The only critters are the black and gray squirrels running about and the birds at the feeders. Love the fabric. Trampoline, grill, blow-up swimming pool with an air leak in it, the occasional rabbit, weeds in my "garden" plot that we started killing grass in but never got far enough to make it an actual garden, garden hose, probably some random toys, 3 cypress trees, 3 red oak trees. Please stop by and visit :-) Thanks for a great giveaway! Oh these are really cute. We have trees, lots and lots of trees, a forest. We have squirels and deer and racoons and coyotes and owls and birds and the occasional stray cat. My backyard -- and my view from the sewing machine - is full of snow with deer tracks to an old apple tree and one squirrel who waits for one of the Jacks to sit in the doorway before romping around on the other side of the glass. Lovely fabric! The fabric is SOOO CUTE! My sheltie is sitting in the snow in my backyard. Thanks for the chance! In my backyard, down past the lawn and the vegetable garden, is my grandmother's house, which is set back from the road into the woods. In HER backyard is a GIANT tom turkey that visits her everyday. It sits on her deck and eats the scraps she's put out for it and I'm pretty sure it watches TV with her through the glass door. It is hiLARious. Thanks for the chance at the giveaway, the fabric is adorable! I adore that fabric!! I have a problem with fabrics with owl's on. I have to have it all!!!!!! 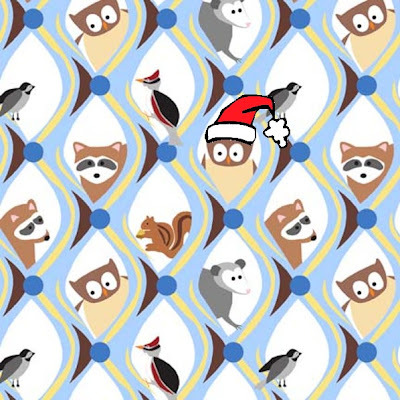 Even better if it has squirrels on it as well! At the moment there is nothing in my back yard other than lots and lots of snow! Goodness I get everything from squirrels and chipmunks to possums, raccoon, rabbits, you name it. We have quite a wildlife show back there. I have cattle in my back yard. That fabric is just adorable! 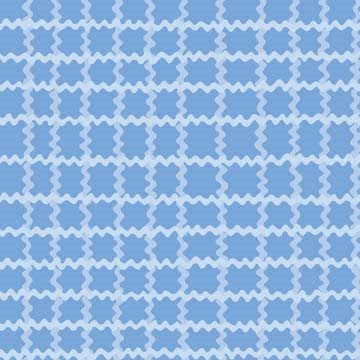 This fabric would be fabulous for a boy! Not often you can say that! Omigosh, I am really loving this fabirc, especially the one with the squirrels! My backyard is full of snow along with 2 big pots that I should have moved before the storm. oh well...... I keep waiting to see if the neighbor's cat will still visit to stalk the mice in the field. cute fabric!! 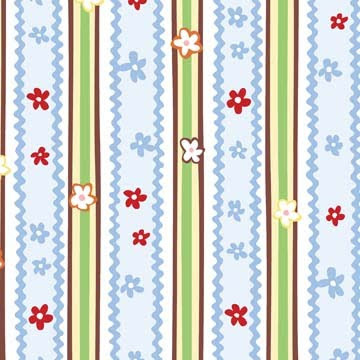 Very cute fabric! I have a dusting of snow and a lot of squirrels!! Snow and sometimes a cat. Can I enter? I won last time? If so..
My back yard is really non-existant. Its about 2 ft wide. We have a pretty large front and side yard. The only thing in my back yard is the steps down from the house and a ditch. The Santa hat is just too much! I love your sense of humor! My backyard? Four raised flower beds waiting for spring to bloom and be planted...cardinals, squirrels, my dog Lady (only occasionally since it's so dang cold! ), sparrows, nuthatches, the occasional opossum, skunk...chipmunks and nuthatches and a lot of grass just waiting to be played on! SNOW! not fresh pretty snow, but yucky ugly stage snow. LOl I'm in an apartment...no backyard! But it's snowing, and since my building is surrounded by woods, a cemetery, and a green space between my building and another one, I'm seeing lots of squirrels, but mostly just frolicking dogs! I have beautiful desert mountain ranges. There is nothing there for a hundred miles or more. I love the desert. I also love your cute charm pack. lots of SNOW! also, an igloo/cave that my husband helped my 2 year old make. We have a swingset in our back yard...even though we have pretty cold IN weather, we keep the swings out all year long because any chance we get, we like to swing..I especially like it after lunch and right before naps...nice cold fresh air to tucker out the kids! 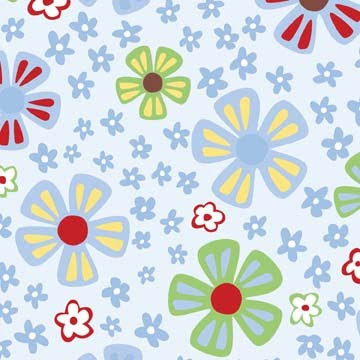 cute cute frolic fabric! thansk for a chance. My backyard is sort of unfinished, and has been for years.........we're working on it. But there are two things I love back there: A big wooden swing for me and my honey to sit on and relax (don't get to very often, but sometimes)and a fire pit where we have hot dogs and s'mores whenever the grandkids visit! I, too, was wondering if it was Christmas fabric. I love the idea and think you should pass it on. This is some of my favorite fabrics. I have purchased some in greens to do pjs for my grandson. My backyard is interesting lately. This summer we had a mountain lion that killed our dog out there. Since then we now have squirrels (which wouldn't come when the dog was there), rabbits, skunks, raccoons, possums, coyote and who knows what else in the wee hours. Abit of snow and one industrious woodpecker has decided to take up residence this year. this fabulous fabric is too cute! There are pine cones in my backyard, but after today they will be gone. 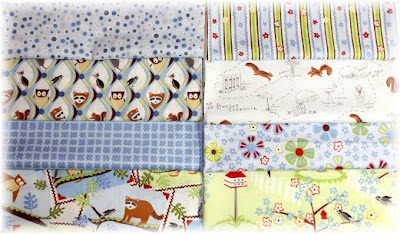 ;-) Cute, cute fabric! What cute fabric. We finally have grass in our backyard! There are also some kids toys on the patio, some wooden outdoor furniture, and some weeds in the non-grassy area. Happy holidays! I'll tell you what's not in my backyard: A fence. We're in a rental and we are so sad to not have it fenced in for our kids to enjoy with out mom having a heart attack every 5 minutes wondering if they have wandered off, so sadly there are no children or dogs playing in our back yard. *sigh* I wish I were back in our lovely TN home with a giant 1/2 acre fenced in back yard with a swing set, garden, and newly planted fruit trees! My backyard has a pole barn, apple tree, pear tree, corn field and lots of dog poo. Lots. I have 2 dogs. It's a minefield out there. We also have the occasional raccoon, skunk, deer, rabbits, squirrels, coyotes, etc. we have orchids blooming - dark purple, two pot of green (?) with purple center and one any time orange blooms. I have a bit of grass with trees ad a fence behind my apartment that divides us from the houses. We get to watch the squirrels play along the fence and in the trees as well as many birds! And this year we even had a front row seat to the lives of baby birds in the tree just off our back porch! So fun for a 3 yr old! An eagle in a tree, several deer and about 30 wild turkeys, horses on the ground and the best of all....the Salmon River which is almost frozen over. LOVE this line! This fabric is so cute!! What's in my backyard? A trampoline, a blanket of wet, dead leaves, and squirrels gathering pecans. My backyard has trees, a playfort, sandbox, squirrels, snow, birds. This past summer we were visited by 5 deer, quite unheard of in this part of the city. My backyard has a huge, homemade swingset and jungle gym. Then just past that is the cow pasture and river. And that is some darned cute fabric! I can see a ton of projects out of that! My yard is full of slushy snow because it is lightly raining!! YUCK!!! I want the snow back!!! The fabric is adorable. Sorry, I was with your son! I thought it was Christmas fabric too!!! We have deer in our back yard and we feed them. They are just so beautiful! dampness, yup and squirrels too...still! Frolic is great! 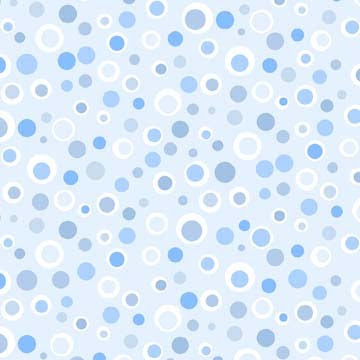 love the blues. I still have lots of Feathered Friends ready to be sewn up in a quilt! Hope Christmas is going well at your house! There is a small wooden kid's house in my backyard. It evens comes with a porch. Our back yard is filled with snow and sunshine. It is beautiful today. Thank you for your giveaway. The fabric is soooo cute. I've got some dogs, some chickens, a playyard for my kids, our garden and a ton of room to roam! Thanks for the opportunity at this great fabric! you don't want to look in my backyard... lots of garden rubbish we need to dump and rain and sleet.... brrrrrr... I bet you wish you never asked!! Lovely giveaway, thanks for the chance to win. I have a ton of branches and leaves all over the place! I really need to find time to clean it all up! My backyard is full of deer eating the last of the grass in my yard in the woods... Love the fabric. We have a former Christmas tree lot just beyond our backyard. The previous owner of our house used to own it and now it is defunct. But the pretty evergreens are still there. Sadly, I don't have a backyard; we are stuck in an apartment for now. But, I have a balcony crammed with junk! And we have lovely grass all around that somebody else takes care of! That is a really cute line of fabric! My backyard is just open space and I have an assortment of wildlife that pass through- deers, coyotes, bobcat, wild boars & wild turkeys too! I've got a brick patio with planters, roses, peonies, and my favorite - hydrangea. Would someday love to have a *proper* garden, but this will do for now! Five fruit trees are in my backyard...the only critters I usually see back there are my five dogs and one cat! I have pheasants, squirrels, the odd chipmunk, a muskrat who comes up out of the brook occasionally and a babbling brook. There is no snow cover yet but when it does come I'll be able to see the little mice and voles burrowing tunnels under the snow to get some seeds from the bird feeder. The Frolic fabric is soo much fun, I love it. My back yard is a lake filled with fish, turtles, and alligators! The fabric is so cute and the designer?, you gotta love that last name! Thanks for the chance! What's in my backyard? Rabbits, squirrels, possums and an occasional racoon and my pink flamingo of course! 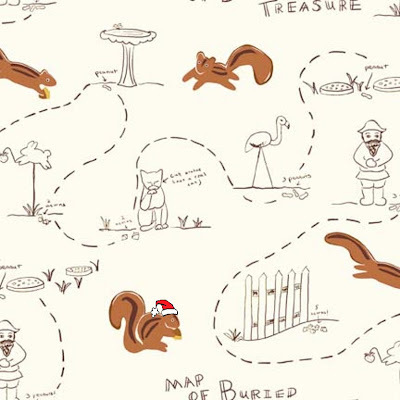 I've bought the treasure map fabric already...it's so cute! My back yard is filled with lots of snow. And not one footprint, so its beautiful. Currently my backyard is buried in snow! And we have the cutest rugged wood western bench that's got a foot of snow sitting on it! 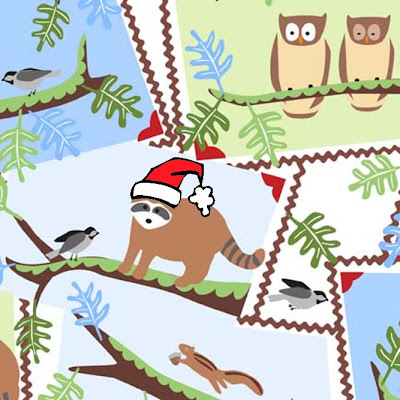 Oh my gosh, that raccoon is adorable! At our old house, we had possums constantly!! Now we just have a bunch of bunnies, and earlier this fall my neighbor saw a deer pass from her yard to mine. This is VERY odd because we are in the middle of town!! My backyard is FULL of horses!! I'm ok with that really. They are always awesome to watch! Snow, snow and more snow! And frolicking dog tracks (Carlos loves to roll around in the snow even if it's below zero). nothing. . .I'm in an apartment, my deck looks over the parking lot. But there is some snow on the deck. I'm glad you showcased this fabric, it's not something I would have normally looked at but there are several very cute pieces. Right now we have a bright winter sun shining into the backyard. Other than that, it's quite barren since it's so cold out today. Love the fabric--love your site! My backyard? Well, technically it's a parking lot, so a lot of random cars, as well as my own! We have two little Song Sparrows that hang out near our porch door. It's so much fun to watch them scurry, hop, and flit back and forth on their hunt for tasty morsels. My backyard is always filled with all kinds of animals. I live in a city, but we have deer, rabbits, racoons, and armadillos in our backyard. It is like a zoo back there. I love this fabric. Not much since my husband built a shop out there. I guess there's a swing set, and a small amount of grass, and loads of concrete. Thanks for the chance to win! My backyard...a massive playhouse for our kids, a teeny tiny snow pile that is the beginnings of a hill, my husband's shed, and our family dog!! A lawn that's slowly turning brown, a bench, a bird feeder and a little garden that's now empty waiting for spring. Birdfeeders, birds of course, my neighbor's big furry dumb cat after those birds, squirrels after the birdseed, lovely cords of wood all stacked and ready to go in our wood stove, very toasty. Our immediate backyard is fenced for the dogs, but behind that is a hill that shoots way up and is forested in really tall trees, like oak and sassafras, hickory, elm, etc. In the side yard, though, is a beautiful, healthy whitetail button-buck, eating nice green grass and clover- that is about the only thing good to eat out here right now. And birds, lot of them at my feeders- thistle, suet and sunflower seeds keep us in the poor house all winter! I love Frolic! Thanks for the chance to win some! i realy love the fabric! we actualy dont even go there. but we do have a front yard that is much better that was terrable when we got here but we planted grass and frowers and now it looks nice! My backyard is filled with slushy snow - not so nice right now. I have trees and a patio set and a swing set for the grandbabies. There are rose bushes and forsythia bushes. I love my back yard! 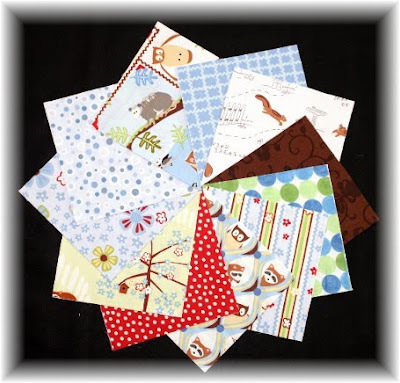 And I would love to win some cute fabric! This question really made me laugh. Why? Because we don't have a backyard. We are the front of a duplex/townhouseish rental, and we have the front yard and the other folks have the back. Kind of lame. I can't wait until we have a backyard someday! Why do you have to be so popular? Why can't you just have giveaways that say, "Annie this is for you!"?? Instead I have to compete with 120+ other bloggers/customers for even a chance to get a glimpse of your fabulous giveaways! :o) I jokes... but really, I'd love to win this one! :o) if not, I might have to just purchase it cause it's so cute. A whole lot of nothin' is in my backyard right now! Just weeds, bare mud and a few toys. I'm the sewing type rather than the gardening type! Fun blog! My backyard is now a ski ramp training area. My boys have tilted the banquet tables up against the picnic tables, added their skate ramps and they snow board down the tables and up the ramps. It's really quite creative although somewhat dangerous! Too bad the rain melted all the snow. I just love this fabric. All kinds of birds are in my backyard flying to and fro on the birdfeeders. Getting filled up because we are supposed to get snow tomorrow. We have a small deck and a small back yard, just big enough for the dog to strtch his legs and do his business. We have an apartment but what is directly behind us is our community swingset. I miss taking my kids there, it's too cold right now! A lot of what's in this fabric is in my back yard! Raccoons, chickadees, possum even the woodpecker along with a lot of other wildlife. We've even had treasure hunts in our woods. I love this fabric! My backyard has several rose bushes, a lilac bush, azalea bushes, and some lovely green grass...oh a a shed to hold the tools needed to keep all these things growing in the warmer weather. Love the fabric! I love my backyard. My husband however, is at war with a couple of squirrels. They shred pine cones and litter all over the lawn. It can only be pick up, not mowed up. They actually sit in the tree and throw the cores at him while he works! That fabric is adorable! Thanks for the giveaway. funny fabrics, love the first one. I have a beautiful creek with a small bridge over looking a pasture. In my backyard, I have a lovely vintage pie crust glider that we thrifted this summer and a snowman. Dirt, dirt, and more dirt... we really need to landscape! love all that fabric! do we need to leave an email if it's linked to our blogger and you can reply to the comment? I love this line especially the In the Beginning one. In my backyard is a swingset that is too cold to be used currently. There's a lot of snow! and some dead compost worms. Wonderful fabric!! Love it! My backyard has squirrels, raccoons, deer, lots of birds, some mice and moles and an occasional coyote. I hope I win!! MOLE HILLS...giant mole hills. They have taken over. And, just a speckling of snow, but most of that has melted. :) Happy holidays, this fabric is darling, btw. My backyard is partially grassy mud with a small "garden" that is also mud...and to make matters worse, the dog has been digging in the garden! Cute Fabric! My backyard is really boring in the winter outside of an occasional squirrel or rabbit visiting. And the neighbor's cat. Cute fabric! We have quite a few squirrels scurrying around the yard collecting acorns. Just love these fabrics. Unfortunately my back yard consist our small deck and then the neighbors house. Love the fabric that you showed. There is SNOW in my backyard! Just in time for Christmas! My backyard has lots of snow right now and a partially frozen creek. By backyard is filled with snow at the moment. We don't have snow that often any more in Holland, so it is a really nice view at the moment. Wish i had a backyard with so much animals as on the fabric. We have some very cold cement and a dead plant that someone needs to take care of! Of course, if it could get above freezing, I might be willing to go out and do it, but I don't anticipate that happening! Oh my goodness...I've not seen this fabric before! What an awesome baby boy quilt that would make. Let's see...in my backyard, you would have to wear your boots because it is flooded with all the rain we've had lately. Even the dog doesn't want to go out there. Yuk. Cute fabric! My backyard has two empty containers just STARING at me waiting for some flowers, or greenery, or something!